Knowing that we can design an object to respond sympathetically with the earth’s vibration, how do we utilize that energy? How can we turn it into usable electricity? We must, first of all, understand what a transducer is. Early on we discussed the piezoelectric effect vibration has on quartz crystal. Alternately compressing and releasing the quartz produces electricity. Microphones and other modern electronic devices work on this principle. Speak into a microphone and the sound of your voice (mechanical vibration) is converted into electrical impulses. The reverse happens with a speaker where electrical impulses are converted into mechanical vibrations. It has also been speculated that quartz-bearing rock creates the phenomenon known as ball lightning. The quartz crystal is the transducer. It transforms one form of energy into another. Understanding the source of the energy and having the means to tap into it, all we need to do is convert the unlimited mechanical stresses therein into usable electricity utilizing quartz crystals! The Great Pyramid was a geomechanical power plant that responded sympathetically with the earth’s vibrations and converted that energy into electricity! They used the electricity to power their civilization, which included machine tools with which they shaped hard igneous rock. Ok, you may say, how does this power plant work? It’s all very well to throw out a broad statement like that which rationalizes your own theory on machining, but we need more facts and proof that what has been stated is more than an interesting and radical theory. It has to have more proof based on truth and fact! Well let’s start with the power crystal, or transducers. It so happens that the transducers for this power plant are an integral part of the construction that is designed to resonate in harmony with the pyramid itself, and also the earth. The King’s Chamber, in which a procession of visitors have noted unusual effects, and in which Tom Danley detected the infrasonic vibrations of the earth, is, in itself, a mighty transducer. In any machine there are devices that function to make the machine work. This machine was no different. Though the inner chambers and passages of the Great Pyramid seem to be devoid of what we would consider to be mechanical or electrical devices, there are devices still housed there that are similar in nature to mechanical devices created today. These devices could also be considered to be electrical devices in that they have the ability to convert or transduce mechanical energy into electrical energy. You might think of other examples, as the evidence becomes more apparent. The devices, which have resided inside the Great Pyramid since it was built, have not been recognized for what they truly were. Nevertheless, they were an integral part of this machine’s function. The granite out of which this chamber is constructed is an igneous rock containing silicon quartz crystals. This particular granite, which was brought from the Aswan Quarries, contains 55% or more quartz crystal. Dee Jay Nelson and David H. Coville see special significance in the stone the builders chose in building the King’s Chamber. “This means that lining the King’s Chamber, for instance, are literally hundreds of tons of microscopic quartz particles. The particles are hexagonal, by-pyramidal or rhombohedral in shape. Rhomboid crystals are six-sided prisms with quadrangle sides that present a parallelogram on any of the six facets. This guarantees that embedded within the granite rock is a high percentage of quartz fragments whose surfaces, by the law of natural averages, are parallel on the upper and lower sides. Additionally, any slight plasticity of the granite aggregate would allow a ‘piezotension’ upon these parallel surfaces and cause an electromotive flow. The great mass of stone above the pyramid chambers presses downward by gravitational force upon the granite walls thereby converting them into perpetual electric generators. While Nelson and Coville have made an interesting observation and speculation regarding the granite inside the pyramid, I am not sure that they are correct in stating that the pressure of thousands of tons of masonry would create an electromotive flow in the granite. The pressure on the quartz would need to be alternatively pressed and released in order for electricity to flow. The pressure they are describing would be static and, while it would undoubtedly squeeze the quartz to some degree, the electron flow would cease after the pressure came to rest. Quartz crystal does not create energy; it just converts one kind of energy into another. Needless to say, this point in itself leads to some interesting observations regarding the characteristics of the granite complex. Above the King’s Chamber are five rows of granite beams, making a total of 43 beams weighing up to 70 tons each. Each layer is separated by a space large enough to crawl into. The red granite beams are cut square and parallel on three sides but were left seemingly untouched on the top surface, which was rough and uneven. Some of them even had holes gouged into the top of them. In cutting these giant monoliths, the builders evidently found it necessary to treat the beams destined for the uppermost chamber with the same respect as those intended for the ceiling directly above the King’s Chamber. Each beam was cut flat and square on three sides, with the topside seemingly untouched. This is interesting, considering that the ones directly above the King’s Chamber would be the only ones visible to those entering the pyramid. Even so, the attention these granite-ceiling beams received was nonetheless inferior to the attention commanded by the granite out of which the walls were constructed. It is remarkable that the builders would exert the same amount of effort in finishing the 34 beams, which would not be seen once the pyramid was built, as they did nine beams forming the ceiling of the King’s Chamber which would be seen. Even if these beams were imperative to the strength of the complex, deviations in accuracy would surely be allowed, making the cutting of the blocks less time consuming. Unless, of course, they were either using these upper beams for a specific purpose, and/or were using standardized machinery methods that produced parts with little variation. Traditional theory has it that the granite beams served to relieve pressure on the chamber and allow this chamber to be built with a flat ceiling. I disagree. The pyramid builders knew about and were already utilizing a design feature that was structurally sound on a lower level inside the pyramid. 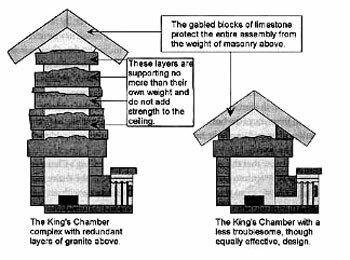 If we look at the cantilevered arched ceiling of the Queen’s Chamber, we can see that it has more masonry piled on top of it than the King’s Chamber. The question could be asked, therefore, that if the builders had wanted to put a flat ceiling in this chamber, wouldn’t they have only needed to add one layer of beams? For the distance between the walls, a single layer of beams in the Queen’s Chamber, like the 43 granite beams above the King’s Chamber, would be supporting no more than their own weight. To include so many monolithic blocks of granite in the structure is redundant. Especially when we consider the amount of incredibly difficult work that must have been invested in quarrying, cutting, transporting them 500 miles from the Aswan quarries, and then raising them to the 175 foot level of the pyramid. There is surely another reason for such an enormous effort and investment of time. And look at the characteristics of these beams. Why cut them square and flat on three sides and leave them rough on the top? If no one is going to look at them, why not make them rough on all sides? Better still, why not make all sides flat! It would certainly make it easier to assemble them! The 43 giant beams above the King’s Chamber were not included in the structure to relieve the King’s Chamber from excessive pressure from above, but were included to fulfill a more advanced purpose. A simple yet refined technology can be discerned in the granite complex at the heart of the Great Pyramid, and with this technology the ancient power plant operated. The giant granite beams above the King’s Chamber could be considered to be 43 individual bridges. Like the Tacoma Narrows bridge, each one is capable of vibrating if a suitable type and amount of energy is introduced. If we were to concentrate on forcing just one of the beams to oscillate, with each of the other beams tuned to that frequency or a harmonic of that frequency, the other beams would be forced to vibrate at the same frequency or a harmonic. If the energy contained within the forcing frequency was great enough, this transfer of energy from one beam to the next could affect the entire series of beams. A situation could exist, therefore, in which one individual beam in the ceiling directly above the King’s Chamber could indirectly influence another beam in the uppermost chamber by forcing it to vibrate at the same frequency as the original forcing frequency or one of its harmonic frequencies. The amount of energy absorbed by these beams from the source, would depend on the natural resonant frequency of the beam. The ability of the beams to dissipate the energy they are subject to would have to be considered, as well as the natural resonating frequency of the granite beam. If the forcing frequency (sound input) coincided with the natural frequency of the beam, and there was little damping (the beams were not restrained from vibrating), then the transfer of energy would be maximized. Consequently, so would the vibration of the beams. It is quite clear that the giant granite beams above the King’s Chamber have a length of 17 feet (the width of the Chamber) in which they can react to induced motion and vibrate without restraint. 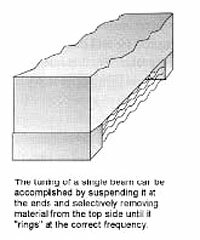 Some damping may occur if the beams adjacent faces are so close that they rub together. However, if the beams vibrate in unison, it is possible that such damping would not happen. To perfect the ability of the 43 granite beams to resonate with the forcing frequency, the natural frequency of each beam would have to be of the same frequency as the forcing frequency, or be in harmony with it. It would be possible to tune a length of granite, such as those found in the Great Pyramid, by altering its physical dimensions. Striking it while it was being held in a position similar to that of the beams above the King’s Chamber, as one would strike a tuning fork, could induce oscillation of the beam. The frequency of the vibration would be sampled and more material removed until the correct frequency had been reached. Rather than a lack of attention, therefore, the top surfaces of these granite beams may have arrived at their present shape through the application of more careful attention and work than the sides or the bottom. 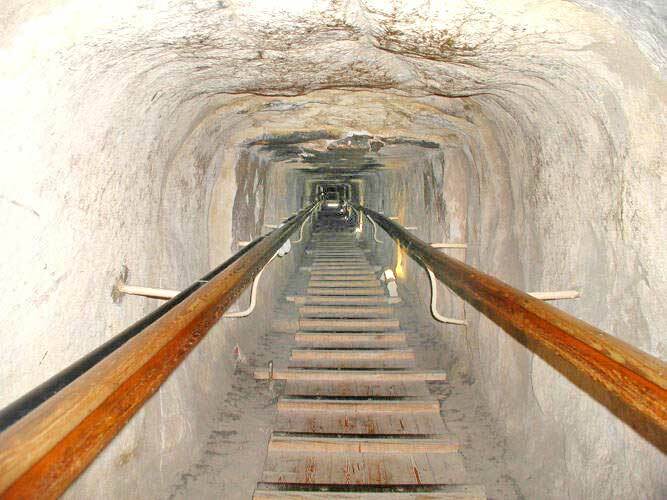 Before being placed inside the Great Pyramid, each beam may have been suspended on each end in the same position that it would hold once placed inside the Great Pyramid, and a considerable amount of attention paid to the upper surface. Each granite beam was shaped and gouged on the topside as it was tuned! Thousands of tons of granite were actually tuned to resonate in harmony with the fundamental frequency of the earth and the pyramid! The granite beams above the King’s Chamber resemble what a granite beam might look like after it has been tuned in such a manner. After cutting three sides square and true to each other, the remaining side could have been cut and shaped until it reached a specific resonating frequency. The removal of material on the upper side of the beam would take into consideration the elasticity of the beam, as a variation of elasticity in the beam might result in more material being removed at one point along the beam’s length than another. The fact that the beams above the King’s Chamber are all shapes and sizes would support this speculation. In some of the granite beams, it wouldn’t be surprising to find holes gouged out of the granite as the tuners worked on trouble spots. “These markings, moreover, have only been discovered in those dark holes or hollows, the so-called ‘chambers,’ but much rather ‘hollows of construction,’ broken into by Colonel Howard Vyse above the ‘King’s Chamber’ of the Great Pyramid. Another reason for the holes gouged in the beams near the end of the beams may have been to provide feedback into the center of the beam, instead of transferring vibration into the core masonry. Although we must consider that both reasons given for the “bat-holes” may be possible explanations for their existence, it does not preclude other possibilities, which have yet to be considered. According to Boris Said, who was with Tom Danley when he conducted his tests, the King’s Chamber’s resonated at a fundamental frequency and the entire structure of the King’s Chamber reinforced this frequency by producing dominant frequencies that created an F sharp chord. Using large amplifiers F sharp is the frequency that is in harmony with the earth. Said claimed that the Indian Shamans tuned their ceremonial flutes to F sharp because it is a frequency that is sacred to mother earth. Testing for frequency, Tom Danley placed accelerometers in the spaces above the King’s Chamber, but I don’t know whether he went as far as checking the frequency of each beam. Further research would need to be conducted before any assertion could be made as to the relationship these holes may have with tuning these beams to a specific frequency. However, when we consider the characteristics of the entire granite complex, along with other features found in the Great Pyramid, it seems clear that the results of this research will be along the lines of what I am theorizing. Without confirmation that the granite beams were carefully tuned to respond to a precise frequency, I will infer that such a condition exists in light of what is found in the area. While I have not found any specific record of anyone striking the beams above the King’s Chamber and measuring their resonant frequencies, there has been quite a lot written about the resonating qualities of the coffer inside the chamber itself. The coffer is said to resonate at 438 hertz and is at resonance with the resonant frequency of the chamber. This is easily tested and has been noted by numerous visitors to the Great Pyramid, including myself. Another interesting discovery was made by the Schor expedition. This is a preliminary report, told to Art Bell by Boris Said, but it was noted that the floor of the King’s Chamber does not sit on solid rock. Not only is the entire granite complex surrounded by massive limestone walls with a space between the granite and the limestone, the floor itself sits on what is characterized as “corrugated” shaped rock. It’s no wonder the entire chamber “rings” while walking around inside! Note, also, that walls of the chamber do not sit on the granite floor, but are support outside and 5-inches below the floor level. The granite complex inside the Great Pyramid, therefore, is poised ready to convert vibrations from the earth into electricity. What is lacking is a sufficient amount of energy to drive the beams and activate the piezoelectric properties within. The ancients, though, had anticipated the need for more energy than what would be collected only within the King’s Chamber. They had determined that they needed to tap into the vibrations of the earth over a larger area inside the pyramid and deliver that energy to the power center - the King’s Chamber - thereby substantially increasing the amplitude of the oscillations of the granite. While modern research into architectural acoustics might predominantly focus upon minimizing the reverberation effects of sound in enclosed spaces, there is reason to believe that the ancient pyramid builders were attempting to achieve the opposite. The Grand Gallery, which is considered to be an architectural masterpiece, is an enclosed space in which resonators were installed in the slots along the ledge that runs the length of the Gallery. 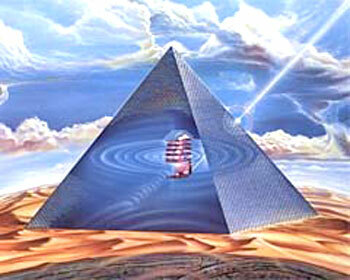 As the earth’s vibration flowed through the Great Pyramid, the resonators converted the energy to airborne sound. By design, the angles and surfaces of the walls and ceiling of the Grand Gallery, caused reflection of the sound and its focus into the King’s Chamber. Although the King’s Chamber was also responding to the energy flowing through the pyramid, much of the energy would flow past it. 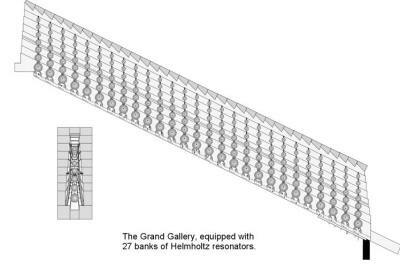 The design and utility of the Grand Gallery was to transfer the energy flowing through a large area of the pyramid into the resonant King’s Chamber. This sound was then focused into the granite resonating cavity at sufficient amplitude to drive the granite ceiling beams to oscillation. These beams, in turn, compelled the beams above them to resonate in harmonic sympathy. Thus, the input of sound and the maximization of resonance, the entire granite complex, in effect, became a vibrating mass of energy. The acoustic qualities of the design of the upper chambers of the Great Pyramid have been referenced and confirmed by numerous visitors since the time of Napoleon, whose men discharged their pistols at the top of the Grand Gallery and noted that the explosion reverberated into the distance like rolling thunder. Striking the coffer inside the King’s Chamber results in a deep bell-like sound of incredible and eerie beauty, and it has been a practice over the years for the Arab guides to demonstrate this resonating sound to the tourists they guide through the pyramid. After being advised of the significant pitch produced by the coffer when it has been struck, and the response of the chamber to this pitch, Horn brought along a device which would give him the exact pitch and frequency. Horn tuned his flute to this tone, which was emitted, which turned out to be ‘A’ 438 cycles per second. In a fascinating booklet about his experiences at the Great Pyramid, Horn describes phenomena concerning the acoustic qualities of the inner chambers. “The moment had arrived. It was time to play my flute. I thought of Ben Pietsch from Santa Rose, California (a man who had told Mr. Horn about the pitch of the coffer) and his suggestions to strike the coffer. I leaned over and hit the inside with the fleshy part of the side of my fist. A beautiful round tone was immediately produced. What a resonance! I remember him also saying when you hear that tone you will be ‘poised in history that is ever present.’ I took the electronic tuning device I had brought along in one hand and struck the coffer again with the other and there is was - ‘A’ 438, just as Ben predicted. And, indeed, the sound, which Paul Horn brought to my living room, was most fascinating. One can understand why many people develop feelings of reverence when exposed to this sound, for it has a most soothing effect on the nerves. For this alone, the record was worth the price. “Sitting on the floor in front of the coffer with the stereo mike in the centre of the room, I began to plan, choosing the alto flute to begin with. The echo was wonderful, about eight seconds. The chamber responded to every note equally. I waited for the echo to decay and then played again. Groups of notes would suspend and all come back as a chord. Sometimes certain notes would stick out more than others. It was always changing. I just listened and responded as if I were playing with another musician. I hadn’t prepared anything specific to play. I was just opening myself to the moment and improvising. After noting the eerie qualities of the King’s and Queen’s Chambers, Paul Horn went out onto the Great Step at the top of the Grand Gallery to continue his sound test. The Grand Gallery, he reported, sounded rather flat compared with the other Chambers. He heard something remarkable at this time. He heard the music he was playing coming back to him clearly and distinctly from the King’s Chamber. The sound was going out into the Grand Gallery and was being reflected through the passageway and reverberating inside the King’s Chamber! It would appear that the coffer inside the King’s Chamber was specifically tuned to a precise frequency, and that the room itself was scientifically engineered to be a resonator of that frequency. Perhaps these observations will finally provide an answer to a mystery that William Flinders Petrie had puzzled over at great length. “The flint pebble that had been put under the coffer is important. If any person wished at present to prop the coffer up, there are multitudes of stone chips in the pyramid ready to hand. Therefore, fetching a pebble from the outside seems to show that the coffer was first lifted at a time when no breakages had been made in the pyramid, and there were no chips lying about. 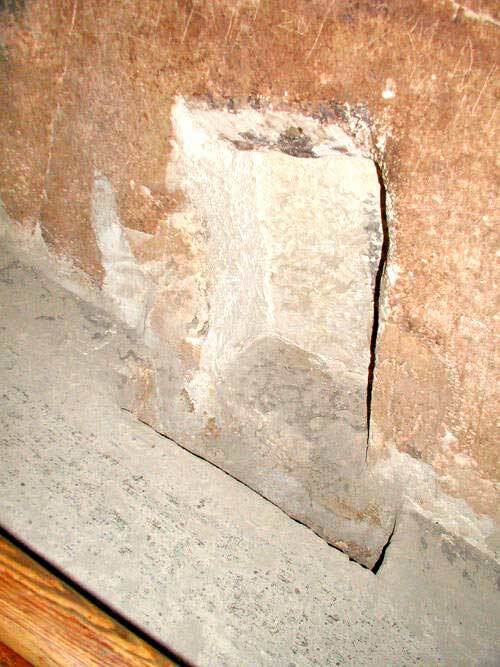 This suggests that there was some means of access to the upper chambers, which are always available by removing loose blocks without any forcing. 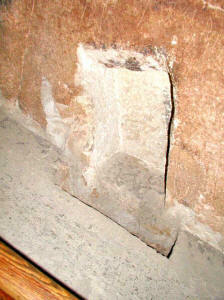 Is it possible that the flint pebble was placed underneath the coffer at the time of the building? And that the pebble served a purpose for those whom placed it there? The alternative answer - that there was free access to the upper chambers - cannot be supported by fact, and even if it was, we are still faced with the question of why someone found it necessary to prop up the coffer. However, if we had just manufactured an object like the coffer and had it tuned to vibrate at a precise frequency, we would know that to sit flat on the floor would dampen the vibrations somewhat. So, by raising one end of the coffer onto the pebble, it could vibrate at peak efficiency. Another unique feature, which needs to be confirmed by on-site inspection, is the ratchet style roof-line. The problem with coming up with an accurate calculation of the true angle of the overlapping stones is that there is conflicting data from the only two researchers that I have found paying these overlaps any close attention. However, preliminary calculations are interesting to say the least. The angle of the Grand Gallery is 26.3 degrees. Smyth measured the height of the Grand Gallery and found that it varied between 333.9 inches and 346.0 inches. The overlaps are estimated to have approximately a 12-inch tilt. Smyth counted 36 overlaps in the 1844.5 inches length of the roof. The surface of the overlapping stones in the roof line is close to a 45 degree angle from a vertical plane (135 degrees polar coordinates, given that the ends of the gallery are 90 degrees). With this tilt of the roof tiles, a sound wave traveling vertically to the roof would be reflected off the tiles at a 90 degree angle and travel in the direction of the King’s Chamber. This gives another report, which didn’t receive much attention, more pertinence. It has been reported that Al Mamun’s men had to break a false floor out of the gallery, and as they broke one stone out, another slid down in its place. It’s a sketchy bit of information that would require further research. Al Mamun’s men were tearing out so much limestone that little attention was given to this. However, it should be kept in mind that there may have been a ratchet-style tiled floor in this gallery that matched the roof. Much of the stone that Al Mamun cut out of the Ascending Passage was dropped down the Descending Passage. Later explorers, such as Caviglia, Davison and Petrie, eventually cleared this passage of all debris, and most of this debris was dumped on the traditional rubbish pit on the North and East side of the Great Pyramid. Petrie reports finding inside the Great Pyramid a prism shaped stone that had a half round groove running its length. He also found in the Descending Passage a block of granite that was 20.6 inches thick with a section of tubular drilled hole cut through the thickness on one edge. Where this granite came from, and for what purpose it was used in the Great Pyramid, was a mystery to Petrie. With more significant findings to attract attention, though, its not surprising these details weren’t given much consideration. It would be possible to confirm that the Grand Gallery indeed reflected the work of an acoustical engineer using only its dimensions. Hopefully, this book will encourage an engineer to create a computer model of the Grand Gallery and perform an analysis by simulating the movement of sound within the cavity. Though I have attempted to find some means to accomplish this, I haven’t been able to find anybody with access to a supercomputer that is willing to do the work, and the software needed to perform the analysis hasn’t, to my knowledge, been published for a micro-computer yet. Other devices, which are obviously not there any more, can be extrapolated. The disappearance of the gallery resonators is easily explained, even though this structure was only accessible through a tortuously constricted shaft. The original design of the resonators will always be open to question; however, there is one device that performs in a manner that is necessary to respond sympathetically with vibrations. There is no reason that similar devices cannot be created today. There are many individuals who possess the necessary skills to recreate this equipment. An Helmholtz resonator would respond to vibrations coming from within the earth, and actually maximize the transfer of energy! The Helmholtz resonator is made of a round hollow sphere with a round opening that is 1/10 - 1/5 the diameter of the sphere. The size of the sphere determines the frequency it will resonate at. If the resonant frequency of the resonator is in harmony with a vibrating source, such as a tuning fork, it will draw energy from the fork and resonate at greater amplitude than the fork will without its presence. It forces the fork to greater energy output than what is normal. 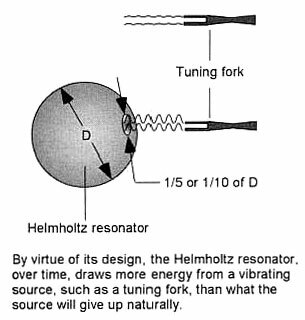 Unless the energy of in the fork is replenished, the fork will lose its energy quicker than it normally would without the Helmholtz resonator. But as long as the source continues to vibrate, the resonator will continue to draw energy from it at a greater rate. The Helmholtz resonator is normally made out of metal, but can be made out of other materials. Holding these resonators in place inside the Gallery, are members that are “keyed” into the structure by first being installed into the slots, and then held in the vertical position with “shot” pins that locate in the groove that runs the length of the Gallery. The material for these members could have been wood, as trees are probably the most efficient responders to natural Earth sounds. There are trees that, by virtue of their internal structure, such as cavities, are known to emit sounds or hum. Modern concert halls are designed and built to interact with the instruments performing within. They are huge musical instruments in themselves. The Great Pyramid can be seen as a huge musical instrument with each element designed to enhance the performance of the other. To choose natural materials, especially in the function of resonating devices, would be a natural and logical decision to make. The qualities of wood cannot be synthesized. Prior to my visit to Egypt in 1986, I had speculated that the slots along the Gallery floor anchored wooden resonators, but that these devices were balanced in a vertical orientation reaching almost to the full height of the gallery. I speculated that the resonators were anchored in the slots at the bottom and held in place by utilizing dowels that fitted into the groove located in the second corbelling and running the full length of the gallery. If this speculation is true, it would logically follow that the geometry of the 27 pair of slots would be unlike the drawings I have studied. The bottom of the slot may be parallel to the horizontal plane, rather than parallel with the angle of the gallery, and the side walls of the slot would be vertical to a horizontal plane, rather than perpendicular to the angle of the gallery. This was a significant detail and a simple one to check out. My first trek inside the Great Pyramid in 1986 didn’t reveal anything about the geometry of these slots as they were filled with dirt and debris. The following day I set out to the Great Pyramid with a soupspoon that I had ‘borrowed’ from the hotel restaurant. Digging out the dirt and debris, with tourists and guides looking at me like I was crazy (actually, it was probably illegal to do this as you need special permission and to carry out excavations in Egypt), I finally came to the bottom of the slot. It was as I predicted it would be: parallel to the horizontal. Also, the sides of the slots were perpendicular to the horizontal. Other slots were perpendicular to the horizontal as well, though some of them had bottoms that were parallel to the gallery floor. In either scenario, it appears that the slots were prepared to accommodate a vertical structure, rather than restrain weight that would exert shear pressure from the side. One of the most remarkable feats of machining can be found inside the Cairo Museum. I have stood in awe before the stone jars and bowls that are finely machined and perfectly balanced. The schist bowl with three lobes folded toward the center hub is an incredible piece of work. With the application of ultrasonics and sophisticated machinery, I can understand how they could be made, but the purpose for doing so has long escaped me. It seems like a tremendous amount of work to go to just to create a domestic vessel! 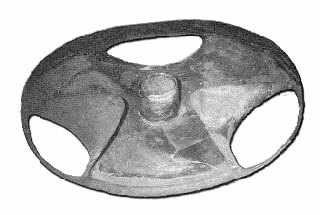 Perhaps these stone artifacts, of which there were over a thousand found at Saqqarra, were used in some way to convert vibration into airborne sound. Are these vessels the Helmholtz resonators we are looking for? The enigmatic Ante Chamber has been the subject of much consternation and discussion. Ludwig Borchardt, Director of the German Institute in Cairo, forwarded one proposal for its use (circa 1925). 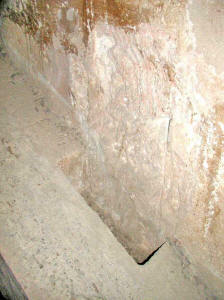 Borchardt’s theory proposed that a series of stone slabs were slid into place after Khufu had been entombed. He theorized that the half-round grooves in the granite wainscoting supported wooden beams that served as windlasses to lower the blocks. Borchardt may not have been far off with his analysis of the mechanism that was contained with the antechamber. 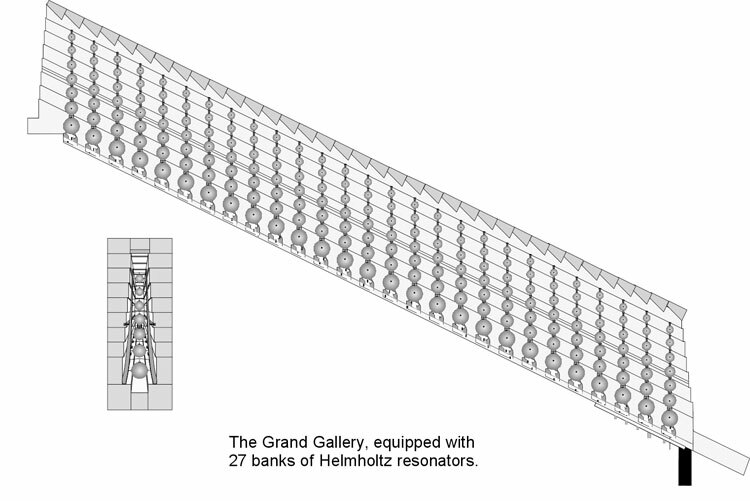 After building the resonators and installing them inside the Grand Gallery, we would want to focus into the King’s Chamber sound of a specific frequency, i.e. a pure tone or harmonic chord. We would be assured of doing so if we installed an acoustic filter between the Grand Gallery and the King’s Chamber. 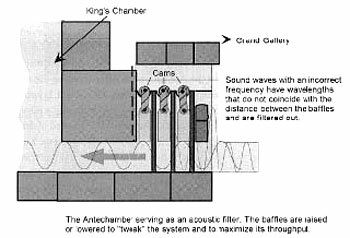 By installing baffles inside the antechamber, sound waves traveling from the Grand Gallery through the passageway into the King’s Chamber would be filtered as they passed through, allowing only a single frequency or harmonic of that frequency to enter the resonant King’s Chamber. Sound wave lengths not coinciding with the dimensions between the baffles are filtered out, thereby ensuring that only no interference sound waves enter the resonant King’s Chamber, a condition that would reduce the output of the system. This may have been accomplished by using cams. By rotating these cams, the off-centered shaft would raise or lower the baffles until the throughput of sound was maximized. A slight movement may have been all that was necessary. Maximum throughput is accomplished when the ceiling of the first part of the passage way (from the Grand Gallery), the ceiling of the passageway leading from the acoustic filter to the resonant King’s Chamber and the bottom surface of each baffle are in alignment. The shaft suspending the baffles would have then been locked into place in a pillar block located on the flat surface of the wainscoting on the opposite wall. During my conversation with Stephen Mehler and Robert Vawter in June, I discussed my theory on the antechamber. 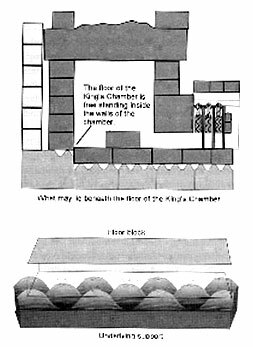 Vawter confirmed my analysis that it was used as an acoustic filter and agreed that further studies were needed to quantify the exact physics employed via “back engineering” the dimensions of the King’s Chamber complex. Knowing that a vibrating system can eventually destroy itself if there is no means to draw off or dampen the energy, there would have to be some way to control the level of energy at which the system operates. As the output of the resonant cavity would only draw off the energy up to a certain level, that being the maximum amount the granite complex could process, there would have to be some means of controlling the energy as it built up inside the Grand Gallery. With the source of vibration being the earth, obviously, numbers 2 and 3 are our best options. There are two ways to eliminate constant vibration, one is to dampen it and the other is to counteract the vibration with an interference wave that cancels it out. Physically dampening the vibration would be impractical, considering the function of the machine. The dampening wouldn’t always be necessary, unlike the dampening needs of a bridge, and indeed would have an adverse effect on the efficiency of the machine. Consequently it would involve moving parts - like those in a piano. Faced with this consideration I immediately started to look closer at the Ascending Passage. It is the only feature inside the Great Pyramid that contains ‘devices’ that are directly accessible from the outside. I call the granite plugs inside this passage ‘devices’ in the same context that I called the granite beams above the King’s Chamber devices because it wasn’t necessary to use granite to block this passage and limestone would have been sufficient. It is obvious that their effectiveness at securing the inner chambers from robbers had the reverse effect. They drew attention to the existence of the Ascending Passage and subsequently the entire internal arrangement of passages and chambers. The granite plugs had to have another reason for being there! Possibly, they were built into the structure to allow or facilitate interference sound waves being introduced into the Grand Gallery and prevent the build-up of vibration within from reaching destructive levels. It may be the reason that the builders selected granite instead of limestone to plug the Ascending Passage. The 3 plugs and their spacing within the passage may have, in fact, provided feedback to signal when the energy was reaching a dangerous level. By directing in or out of phase sound waves up the Ascending Passage, they may have been able to control the energy level of the system. By directing a signal of the correct frequency, they may have also been able to prime the system in this manner also. In other words, the entire system would be forced to vibrate, and once in motion, it would draw energy from the earth with no further input. Sir William Flinders Petrie examined these blocks and described them in Pyramids and Temples of Gizeh. He remarked that the adjoining faces of the block were not flat but had a wavy finish plus or minus .3 inches. I was unable to confirm this when I was in Egypt, because the blocks, exposed by Al Mamun’s tunnel, had slipped since Petrie’s day and are now resting against each other. However, it does make for interesting speculation. Were the faces of the blocks cut specifically to modify sound waves? 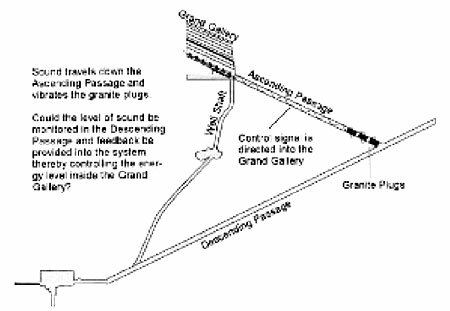 Could the Ascending Passage serve to direct an interference out-of-phase sound wave into the Grand Gallery, thereby controlling the level of energy in the system? There are mysteries still yet to be answered. But, we are not finished yet!